This is my all time favorite morning go to breakfast during the week. 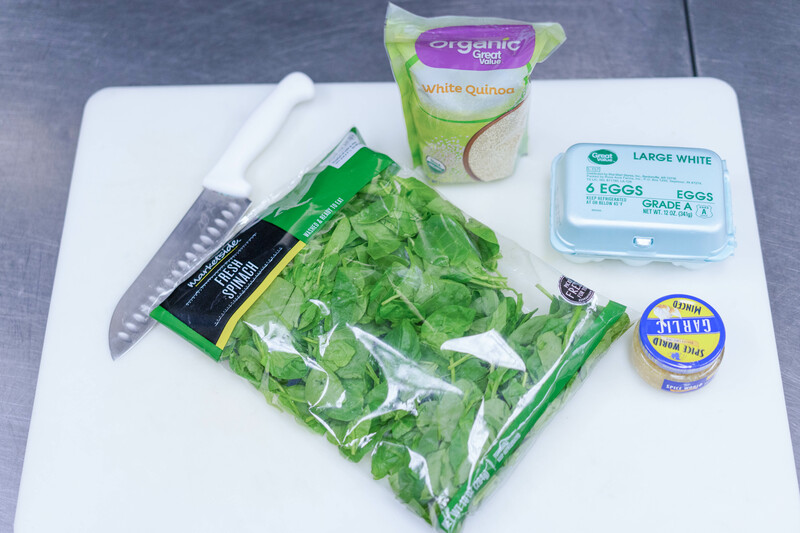 Its fast, cheap, so yummy, and power packed full of nutrients that will kick start your day in the right direction. I make this for my whole family in the mornings and my 3 year old devours it. I’ve made it for so many people that particularly have never had quinoa (pronounced keen- wah), don’t like anything green, or are not big on breakfast. It is always a WIN. Please excuse the industrial looking kitchen in my pics, I was showing my fellow sister, Morgan Knight, how to make this recipe during my dinner break before a Wednesday night church service and we used the church kitchen! Enjoy . I cook 3 cups of quinoa for my family of three on Sunday night. I put it in a glass Tupperware so that it is ready to go in the mornings to come. Ain’t nobody got time to cook quinoa in the morning. Just sayin. I just scoop out in the morning however much I need, and put the rest back in the fridge. Meal prep for the win! 1. 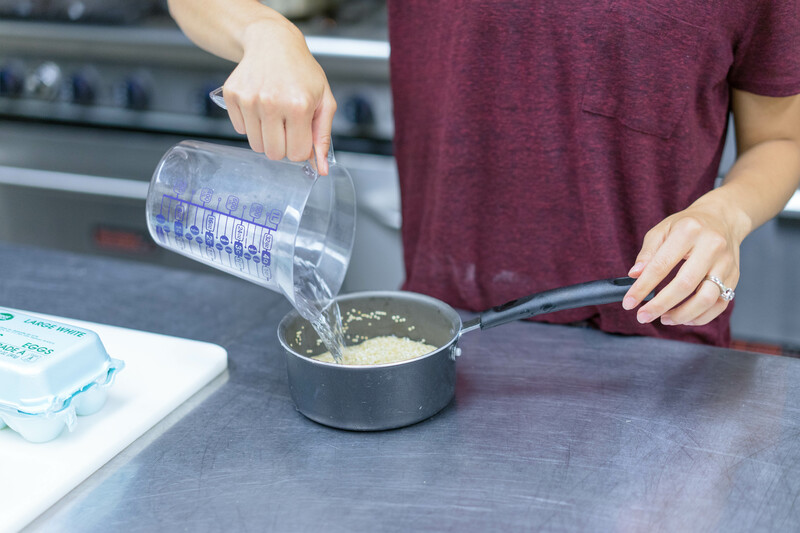 Cook quinoa with 1 part quinoa, 1 part water. The key to cooking quinoa, is WASHING IT. 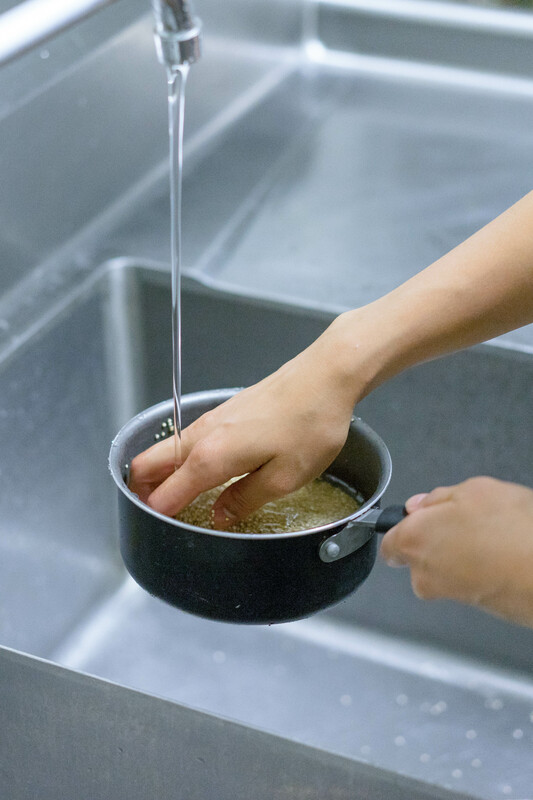 Measure out however much you are cooking into your pot, and swish it around in some water and pour out the dirty water. I do this about 3 times. 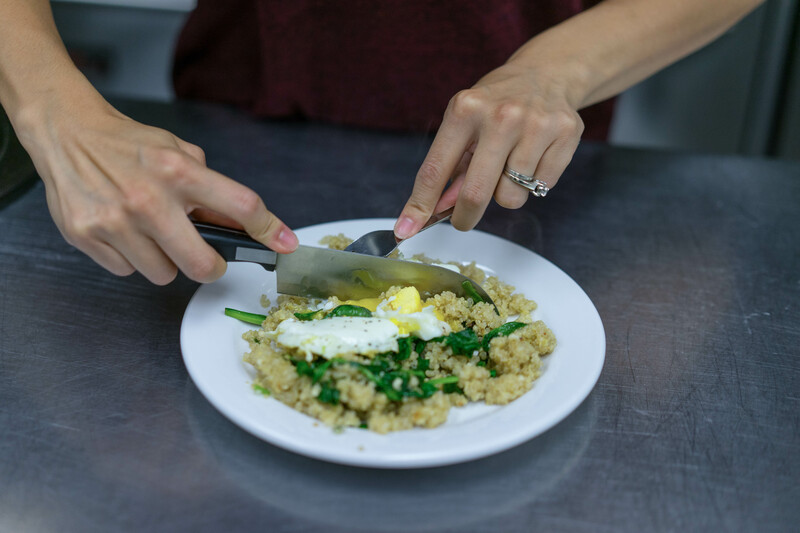 After you’ve washed your quinoa, put the quinoa and water in your pot, add 2 tbsp of olive oil to every ½ cup of quinoa, and bring to a boil. Add salt, and let boil until water is almost cooked down. Then bring heat to low, and cover. Let sit until fully cooked through and all water is gone. I look at it sometimes to check if its ready, fluff it up a bit, and cover again if needed. 2. IF YOU HAVE ALREADY PREPPED YOUR QUINOA, THIS IS WHERE YOUR COOKING ACTUALLY BEGINS. 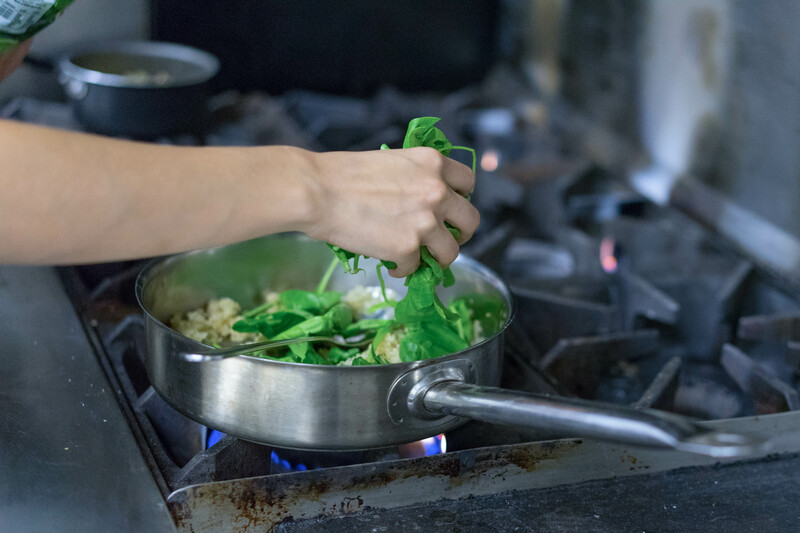 ——————- Bring pan to medium heat and add in minced garlic. I just use the minced garlic in the jar to save time. 3. When garlic is fragrant and hot, add in quinoa. 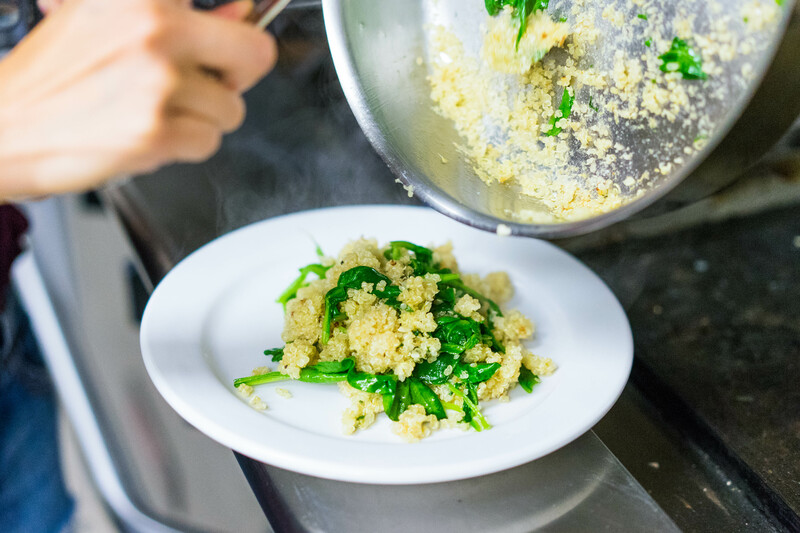 Mix together and allow the quinoa to blanch for about a minute mixing frequently. 4. Add in spinach and allow to wilt. Season. Then plate! 5. 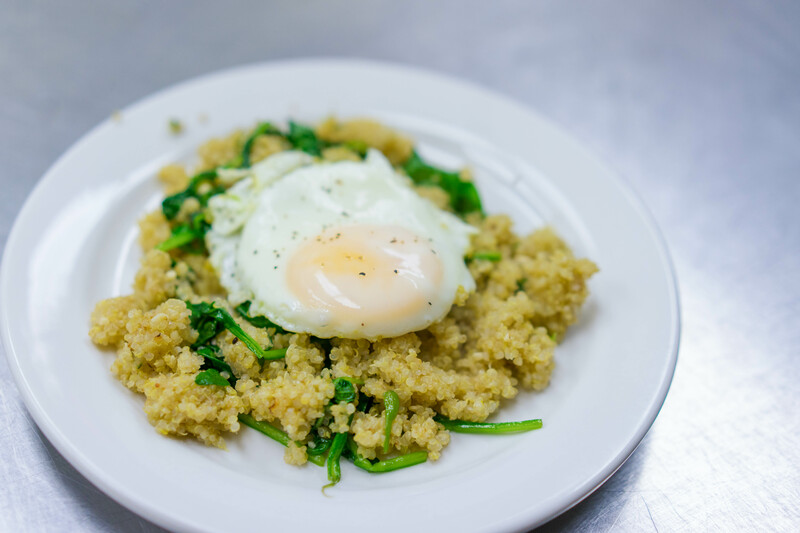 Fry an egg and put on top of quinoa mixture. Perfection. Hi Courtney! Yes it is much healthier. Quinoa is packed with whole proteins because technically quinoa is a seed! But I'm half Asian half Hispanic, so rice is in my blood lol. When I make it now, I actually prefer it a lot of times over rice! Just remember, you have to wash it, or it will taste like dirt ?. Wash and follow directions, you're good to go! I made this for breakfast this morning and it was delicious! I highly recommend it.